Hast thou considered the Drillfield? Last week I brought up some of the landscape projects and indigenous forms that shaped Thomas Jefferson’s thinking and suggested these may have influenced his later political and architectural projects. One of his important projects that offers a particularly potent blend of architecture and politics is his Maverick Plan for the University of Virginia. 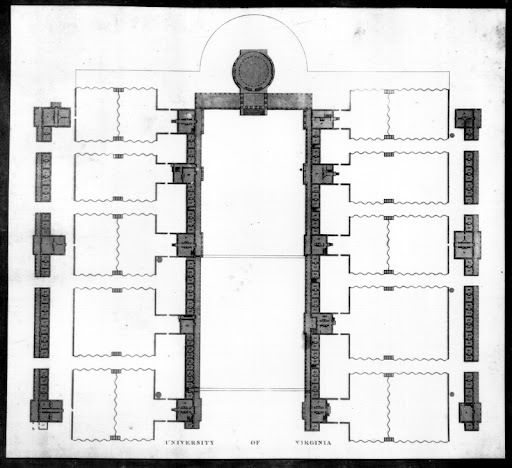 For its time the design was radical in that it offered an alternative to “one immense building”, instead proposing “a small one for every professorship, arranged at proper distances around a square, to admit extension, connected by a piazza”- a very clever idea that has been lionized ad nauseum by historians of that venerable institution. While there is undoubtedly more to glean from the Jeffersonian canon through intricate epistemological jujitsu, I am interested in what might be gained by considering the organizational principles and landscape history of the land grant university down the great wagon road. The Drillfield at the Virginia Polytechnic Institute is defined by scale and history. With regard to scale, the place is huge. The open area at the heart of the University of Virginia is known as the lawn. The Drillfield would contain 7 lawns, and have room left over for a few Rotundas. It is a monstrous, windswept space, leaving undergrads with mild hangovers to traipse across it during dismal winters and hot summers of Southern Appalachia. 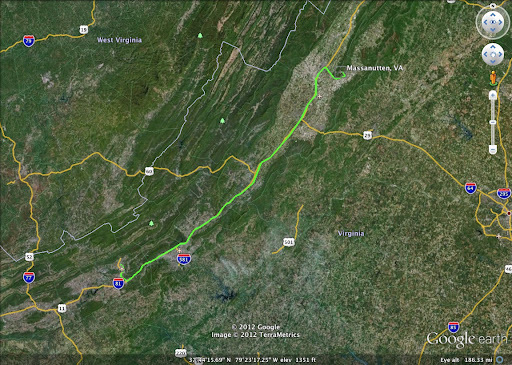 When you are at the Drillfield you feel the Appalachians, you are at the institution created at the terminus of the Great Wagon Road and the start of the Frontier Road headed west to the Cumberland Gap. There is no mistaking that there are big forces at play. The history of the Drillfield is twisted and rambling. Rather than the materialization of a southern aristocrat’s idealization of the proper social relationships of an intellectual institution, it is the result of experimental uses and militarization. Originally the field served as the horticultural farm for the Virginia Agriculture and Mechanics College (later to become Virginia Polytechnic Institute). 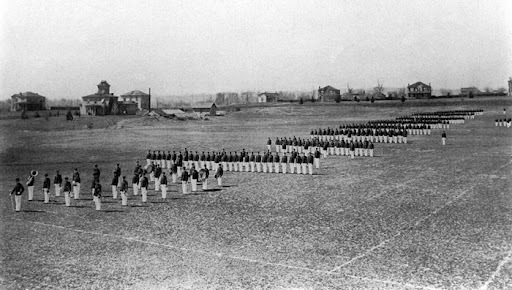 In 1894 a portion of the field was given over to cadet maneuvers and for use by the football team. At this time the Drillfield blended proto-intramural and intercollegiate athletic events with military exercises, agricultural experimentation, quotidian life, as well as what European theorists would call the feteor ‘ephemeral happenings’ but which are known in southwestern Virginia as ‘snowball fights’. The first snowfall of the year brings all classes to a halt so that the student population can divide in to cadets and civilians and engage in some wintry tactical maneuvers. The Drillfield does not care. It doesn’t care about me or my ideas of the spatial relationships that are proper for pursuing higher education. But it does offer spaces of possibility and new forms of use adapting to the needs and shape of the community of which it is a part. And it is in line with the land grant tradition created in part by the visionary geologist William Barton Rogers. In the 1830’s Rogers was a professor of Natural Philosophy at the University of Virginia where he tried unsuccessfully to start an engineering program. As noted by technological historian Edwin Layton, he had better luck implementing his ideas for a polytechnic school after moving to Boston, founding a little institution known as the Massachusetts Institute of Technology. The principles embodied in the land grant ideal- agricultural experimentation, scientific applications of technology, militaristic operations, and quotidian life- seem germane to contemporary concerns in the practice of landscape architecture and urbanism more broadly. And the Drillfield- big, nasty, and possible- is there as an object lesson, offering a way to break the art-historical hegemony of our current landscape pedagogy.